Asset Management helps companies manage and monitor the various types of Assets they possess, be they goods, components, software or hardware, i.e. all the physical entities that fall under the scope of Service Management. Sound knowledge and traceability of available Assets is key: monitoring their origin, availability, location and allocation to resources, use and services offered allows companies to efficiently support their users in providing services, supplying detailed information on the Assets related to specific requests. Through Asset Management, HelpdeskAdvanced, governs the IMAC process (Install – Move – Add – Change) in the life cycle of each Asset by acquiring key information on: its life cycle, stock status, location, configuration, allocation to company users, contracts, maintenance, guarantees and divestments. HelpdeskAdvanced supports you in accurately surveying and identifying your Assets, providing all necessary information to ensure that the governance of specific asset-related services is as efficient as possible, with a focus on defining and controlling infrastructure, costs and service levels managed. Gain a complete and centralised overview of all your company’s Assets and related information. Monitor your Assets’ status and information. 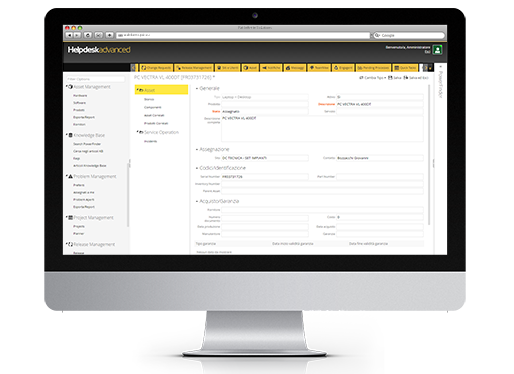 Automatically track and allocate Incidents and Problems to the relevant Assets. Achieve more efficient governance throughout the life cycle of your Assets.